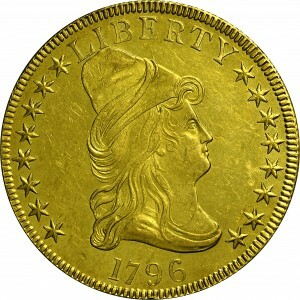 The obverse was engraved with stars arranged eight left and eight right. Some have explained this star count to represent admission of Tennessee as the 16 th state in June 1796. Therefore, one must conclude that these coins were not struck until that time (although no documentary evidence exists to verify these conclusions). 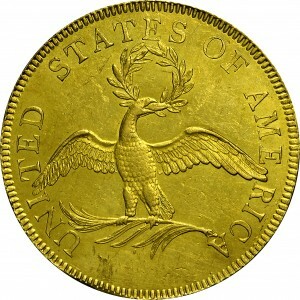 Die state evidence indicates that some of these 1796 eagles were struck before 1797 while others were struck later. Displayed is a wonderful Mint-State example from the Bass Collection, one of only six or seven Mint-State examples from a surviving population of approximately 100 coins. Purchased from RARCOA, February 3, 1975. "Obverse: Stars 8+8. Die center punch in hair to left of ear lobe. Star 15 recut. All stars from a punch having a small notch in the side of one point, as used for 1795. Vertical die crack from field beneath E - cap - hair at left of ear lobe - edge of bust above 9. Lightly clashed, visible at bust line above 796, at nose, at chin. Reverse: Eleven fronds on branch. Die center punch lump on breast at junction with left wing. Tip of palm branch points to right serif of left foot of A. A short die imperfection extends from below branch end. Linear rust lump in field below tip of third frond from right. Lightly clashed, visible in wreath below TES, above and below left wing. Lightly lapped."